Carbo loading: The conventional wisdom in sports nutrition has been to "carbo load" on foods high in carbohydrates before a contest. But now some are saying avoiding gluten carbs can actually enhance athletic performance.Courtesy cyclonebillThe arrival of fall each year brings leaves changing colors, apples ready for the picking and a host of long-distance races contested in more temperate conditions. And with those marathons and other distance tests come the pre-race rituals of "carbo loading," the practice of eating a high carbohydrate meal of pasta to fill a body up with extra energy. But several elite athletes are now shaking up that conventional wisdom. They're saying that they're feeling better and performing more efficiently by focusing their pre-performance meals on the right kind of carbohydrates: gluten-free carbs. Tennis champion Novak Djokovic, New Orleans Saints quarterback Drew Brees and the entire Garmin cycling team are now crediting gluten-free diets as helping them feel and perform better. Djokovic went gluten free in 2010 and has now climbed to become the No. 1-ranked player in men's pro tennis and he credits his new diet with giving him better focus, more endurance and avoiding injury. However, all these benefits so far are anecdotal. There have been no research studies done on the impact of a gluten-free diet on athletic performance. But some nutritionists point out that gluten, evolutionary speaking, is a pretty new entry into the human diet, having only been around 10,000 years. Our digestive systems don't know how to deal with it, so we get no nutritional benefit from it. For most of us, our immune system handles the gluten in our digestive track, just like stray microbes, and works it into our waste. About six percent of the population is gluten sensitive and has to avoid these types of foods entirely. 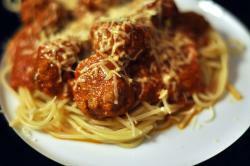 Does this new information change your thoughts about "carbo loading?" Do you avoid gluten foods even if you're not sensitive to them? Share your thoughts with other Science Buzz readers. I get some interesting questions from visitors when I out working on the museum floor. A lot of times I don't have the answers, praticularly about new trends of science that are in the headlines. Here's a top 10 list of things you don't have to worry about, from a scientific viewpoint at least, as you enjoy the final days of summer. Topics addressed include shark attacks, cancer from cellphones and the risks of using your car's air conditioning. 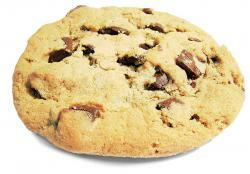 Crumbling marketshare: Cookies are no longer the top snack food among youngsters. Cookie Monster is demanding a recount in Florida.Courtesy brainloc on sxc.huThe cookie is no longer No. 1. Fruit is now the most common snack food consumed by kids ages six and under, according to a new study. NPD Group discovered that youngsters today have much healthier snacking habits than kids did 20-some years ago. • Less likely to have carbonated beverages, ice cream, candy, cake and fruit juice than what kids consumed 20 years ago. • More likely to be chomping on fruit rolls, gummy snacks, yogurt, cracker, granola bars and bottled water. Is this a big deal? Nutritionists think so as snack foods make up about one quarter of the calories taken in by youngsters. And one nutritionist has this new way of thinking of snack foods. Just serve regular food. For instance, a snack might be half a sandwich and a carton of 100% orange juice; bean dip and baby carrots; peanut butter on whole-grain crackers and a small glass of milk; or half a piece of pizza and small glass of milk. For the record, here are a couple lists showing the biggest movers on the snack food rankings. Another thing my mom was wrong about. See? It's better for you now. : Still tastes pretty bad, though.Courtesy churlSince I was in third or fourth grade, I’ve been keeping a list of the things my mom has been wrong about. I think the first item involved her confusing Margot Kidder with Nicole Kidman (as if), the second had to do with whether or not a pack of cigarettes belonged to my teenage brother, and numbers 3 though 8 were all about advanced algebra. Number 9 famously involved her opinion on Terminator 2 (wrong, lady, it turns out it’s an awesome movie!). Item 10, to be honest, never would have happened if the cumin had been labeled properly, but I keep it on the list anyway. 11 is still pending (please, Mother, why would I have that CD? I mean, accordion music? ), but I think I already have a solid number 12: cooking vegetables actually boosts their nutritional value, and not the opposite, as is often believed. 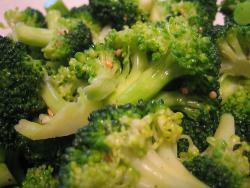 A study in last month’s issue of ACS’ Journal of Agricultural and Food Chemistry has shown that boiling and steaming (but not frying) vegetables like carrots, zucchini and broccoli may in fact increase the available amounts of certain nutrients. So if anyone starts to get all raw-foods on you, you can throw that in their face (unless it’s the carrot, which could take out an eye). Now, I’m sure Mom would say that she knew that all along, and that it’s cooking methods like frying and microwaving that makes foods less nutritious, but that’s what I have lawyers for, and I would remind her that, before she starts anything new, we’re still working out the whole Thanksgiving libel situation. Hold the fries: Fewer school lunch programs are offering unhealthy foods, like French fries, a recent government survey as discovered. It's important since child obesity rates have spiked up in recent years. (Flickr photo by limonada)I have to admit that I’ve been out of the school lunch loop for quite some time now. And I seem to recall that it wasn’t too long ago that many schools, faced with school lunch budgets that were feeling the squeeze, were turning toward more fast-food type menus to try to encourage participation and sales. But a new study out last week says that schools are making a big move toward healthier meals for school kids who are increasingly dealing with overweight issues. The Centers of Disease Control and Prevention reported that last year, about 19 percent of school cafeterias were serving French fries, down from about the 40 percent serving them six years earlier. Another gauge of healthier school food items: the same survey showed that high-fat baked goods were becoming more rare at school fundraisers, declining to 54 percent of the offerings last year compared to 67 percent six years earlier. One more sign of healthier times: about half of schools today offer bottled water instead of sugary sodas or sports drinks at vending machines or snack bars. Only about a third of schools had bottled water available six years ago. Latest statistics show that about one-third of the kids in the U.S. are overweight and 17 percent are considered obese. Here’s the study stat that I found really hard to believe: about one-third of schools in the country still allow tobacco use on campus and at school events by adults. That’s an improvement from six years ago, when about half of schools in the country had smoking bans. In Minnesota, schools have banned smoking on their grounds for a much longer time than that, I believe. Public health officials still have a goal of having a total smoking ban on school grounds. 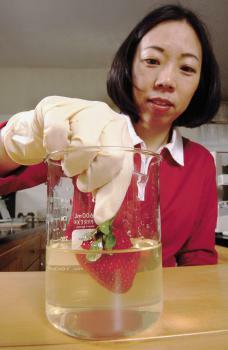 Safer strawberries: Yanyun Zhao, a food technologist at Oregon State University, coats fresh strawberries with a new antimicrobial film that keeps mold away and keeps the berries ripe longer. (Photo courtesy of Oregon State University)We’ve all done it. That leftover food gets wrapped up in tight-fitting plastic wrap to be safely stored in the fridge to be eaten another day. But what if we wrapped up our food before it was even cooked the first time? Researchers are working with the concept right now, finding ways to use natural-occurring germ and disease fighters into thin films and powders that could coat our foods before they get to our dinner table. If they’re successful, we could have safe materials coating our foods that could keep them safe from E. coli, salmonella or other food-borne health problems. Here’s just one idea: strawberries could be coated with a soup-like material made from egg proteins and shrimp shells. That coating would deflect molds from growing on the berries and leave them to be riper for a longer period of time. Likewise, a film made up of a weave of thyme derivatives – which can kill E. coli – could be used in the lining of spinach bags, ending the health alerts like we’ve recently heard about for that vegetable. 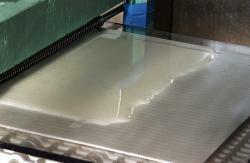 Film for food: A continuous biodegradable protein film begins to form using the new ARS film-making process. (Photo courtesy of U.S. Department of Agriculture)The films are made from a variety of natural products that will dissolve in water. And in some cases, they can even be manipulated to carry flavors, although the big push is to make them flavorless so that the coated food’s natural flavor comes through. To most researchers’ knowledge, none of these new coatings is being used in food products being offered in our stores today. But they’re coming fast. Patents have been applied for and business agreements are being drawn up with food companies to start using this new concept. Have you ever tried one of those new breath-freshening strips or cough drop film? They look like a piece of tapes, you pop them in your mouth and they quickly dissolve to carry their payload into your mouth. These new food films are just like that. In fact, researchers say consumers should be much more likely to embrace this idea if they’ve tried those products already on the market. It’s not a radical new idea as it might sound. Wax has been used as a coating on apples and aspirin for a long time. Some frozen pizzas have a thin layer on film over their crusts to keep the pizza sauce from seeping into it before the pizza is cooked. So what do you think? Would you eat food with thin film on it if you knew it would be safer food? I think this is pretty much a no-brainer “yes” to me. Share your thoughts here with other Science Buzz readers. 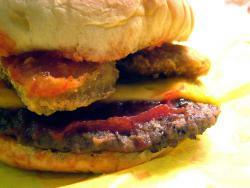 Taste tested: Is this the ultimate kids taste treat -- a Quarterpounder laced with McNuggets? A new study has found that little kids have strong impressions about fast food's quality. (Flickr photo by Slice)After seeing the movie “Supersize Me” I’ve made a conscious effort to reduce my visits to McDonald’s and other fast food outlets. Presenting with that overpowering evidence, I was able to make a decision to make fast food a much smaller portion of my diet. But what about kids who haven’t developed critical thinking skills or the factual data to come to the same conclusion? The results of a new study show that most kids have views that are very skewed toward wanting fast foods. Conducted at Stanford University, the taste test had kids ages 3 to 5 enrolled in Head Start programs sample various foods. Some were packaged in McDonald’s wrappers some were not. Nearly anything that the kids thought was made by McDonald's – even carrots or apple juice – was deemed tastier by the kids than the non-McDonalds sample. The study findings come out just about a month after many major food corporations announced that they were backing off on their marketing efforts to kids. Still, researchers comment, the sales pitches of the past have had a huge impact on little consumers. McDonald's-labeled samples were the clear favorites. French fries were the biggest winner; almost 77% said the labeled fries tasted best while only 13% preferred the others. Fifty-four percent preferred McDonald's-wrapped carrots versus 23% who liked the plain-wrapped sample. The only results not statistically clear-cut involved the hamburgers, with 29 kids choosing McDonald's-wrapped burgers and 22 choosing the unmarked ones. McDonald’s recently announced that it will begin promoting Happy Meals to kids that contain fruit and have lower calories and fat. An independent critic of the study pointed out that a different comparison should have been made on kids’ brand-name product identification. A better comparison might have been to gauge kids’ preferences for McDonald’s items vs. Disney products or some other kid-friendly brand, said Pradeep Chintagunta of the University of Chicago. “I don't think you can necessarily hold this against McDonald's,” he said, since the goal of marketing is to build familiarity and sell products, adding that parents play a large role in the food choices kids make at that age. What do you think? Is this evidence that McDonald’s and other fast-food franchises are exploiting kids? 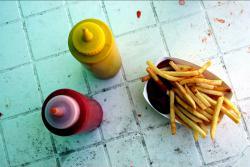 Will a new self-monitored marketing emphasis by fast-food outlets make a difference? Share your thoughts here with other Science Buzz readers. Do you really need that soda? The American Journal of Clinical Nutrition recently drew a correlation between drinking excess amounts of soda or sugary drinks and weight gain. Researchers stated an extra soda or sugary drink a day can pile on fifteen extra pounds in a year. The Journal of Agricultural and Food Chemistry reported ice-cold watermelon is less nutritious than watermelon served at room temperature. Chilled watermelons lose nutrients (ex. lycopene and beta-carotene) more readily when compared to watermelon kept at room temperature.